OAN Nursery Guide is the best resource available for those trying to source plants, nursery supplies and related services. The OAN Nursery Guide contains 400 growers, nearly 5,500 plant varieties, and more than 23,000 total plant and service listings. The Guide is indexed by both common and botanical name for easy reference. Plant listings contain production information for liners, bareroot, seedlings, balled & burlapped, bulbs, container and cuttings. The Services & Supplies listings indicate whether the service/supply is targeted to the landscape, retail or wholesale sectors. Approximately 6,000 copies of the Guide were printed this year; the new edition is introduced at the Farwest Show in late August. These books are distributed free to OAN members and others in the industry via mailings or through distribution at industry trade shows. 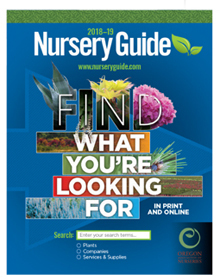 The new NurseryGuide.com has been rebuilt from the ground up to help customers find the plant material they are missing. Fresh features bring plant buyers and sellers together. 2. Call the OAN office at 503-682-5089 and we will take the order by phone and ship the Guide the next day. 3. Pay by Check or Money Order: If you would prefer to use a check or money order, send to: Oregon Association of Nurseries, 29751 SW Town Center Loop W., Wilsonville, OR 97070. Be sure to include a note that payment is for the OAN Nursery Guide, and a copy will be shipped when payment is received. 4. Stop by and pick up a free copy: Stop by the OAN office to pick up your complimentary copy of the OAN Nursery Guide. » View a map and driving directions. Complete this subscriber form and we'll send you the updated guide in August. Complimentary subscriptions will be filled for qualified industry professionals. Please refer to our Editorial and Advertising page for more information about advertising in the OAN Nursery Guide.